With exhilarating team challenges and unique meeting spaces, we offer a corporate experience like no other. Free entry to Wild Place Project. Meeting space at our Courtyard Cafe (Three rooms available ranging in occupancy from eight delegates to 22). Working lunch and refreshments throughout the day. Climbing challenge - Test your nerve on our high ropes course with our crate stack and totem pole team building challenges. (Including: the exhilarating 25ft high leap of faith and Bristol's only 3G giant swing). Situation survival - The Crystal Maze meets the wilderness. Thrust into a survival situation in the woods teams must compete to locate items using maps and radio. Can your team build a shelter and light a fire to help them survive? Other very popular activities are also available - Including Bubble Football, Archery, Go kart building and race, mini Olympics and axe throwing. Corporate members will benefit from a discount. Full exclusivity of Camp Baboon (from 3pm-10am) at Wild Place Project. Overnight accommodation consisting of 10 luxury cabins, each with its own en-suite shower room and private terrace. Private twilight tour of the park and bushcraft activities. Dinner at the Courtyard Café. Team bonding whilst roasting marshmallows around the campfire. Wake up and have a private morning tour of the park. Exclusive all-day use of our fully equipped Giraffe Boardroom (as below), with working lunch and refreshments throughout, either on the day of your stay or day of departure. Specially designed team building quiz. Opportunity to add a unique activity session such as: animal feed, Situation Survival or Action and adventure. 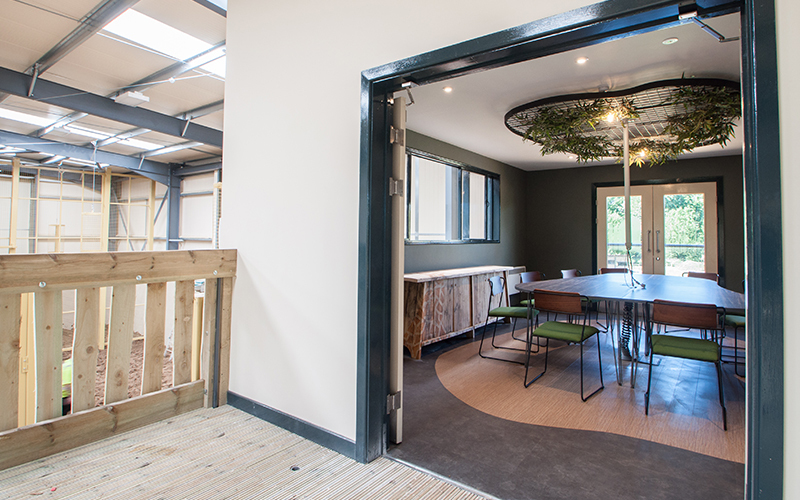 Host a meeting to inspire and impress with our truly unique venue in the heart of Wild Place Project. With a stylish ‘Out of Africa’ design and modern finishes; our newly built Giraffe Boardroom is equipped to suit any type of meeting. What truly sets this space apart is that you will be sharing the building with our three resident giraffe – and we can’t promise they won’t pop their heads in at some point! This is the perfect location to host a meeting with a difference. Exclusive all-day use of our fully equipped Giraffe Boardroom. Working lunch and refreshments throughout. Opportunity to add a unique activity session such as: tour, feed and team quiz, Situation Survival or Action and adventure.